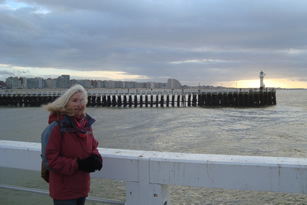 01.03.12 Nieuwpoort (B). The beginning of the meteorological spring. Our return to Greece and to our boat is coming closer. But Nehalinnia was never out of our concerns. During the whole winter the boat was present: that small piece of anchor gear that has to be replaced, the sails we had to bring for a check to sail maker Wittevrongel and the purchase of guardrail cables ( in 5 years the plastic top layer has been completely burned by the sun ) and new halyards ( also due to the sun action ), the frequent email traffic with Simon Trippier ( Sivota Yacht Service ) about adaptations, checks and maintenance of the engine, the exhaust and the shaft, the purchase of spare parts at Turbo's Hoet, of a new Mastervolt battery charger at Etb Paul De Lange, of a new stainless (!) cockpit table leg, the correct ( unfindable in Lefkas ) salt tablets for our Secumar-lifejackets and a new Sun-showerbag ... Daily we had a look to the Greek weather forecast (*) and observed the numerous - but luckily minor - earthquakes at the Emsc-csem-website. As after the previous two winter stays at home, we look back now as well. From a financial crisis we are now fully in an economic crisis that threatens the whole euro area and especially the middle and lower classes. In Belgium we now finally have a federal government but more and more it appears that it are the financial powers that, al over the world as never before, are determining the fundamental choices and, in Europe, are threatening more and more the existing social model. In our opinion we have to oppose on it the only right answer: solidarity. If during these winter months we have appreciated the easy access to information, we often were annoying at the discourse that (blind) cuts leading to general impoverishment would be the only solution. Nothing is less truth when we hear important economists like Krugman and Stiglitz. Closer to home, in the more and more right-conservative Flanders as indeed in most of Europe, economy professors as De Grauwe and Schoors are warning against a counterproductive approach now the almost entire Euro zone enters in recession. The sudden and rather unreal unanimity of the giving lessons Merkozy couple was causing an increasing resentment. That's why we also think that it's important to read (again) the large spread and translated little works by the French Stéphane Hessel [ Indignez-vous! 2010/11 Engl. translation Time for Outrage! with a foreword by Charles Glasssen; Engagez-vous! Entretiens avec Gilles Vanderpooten, Publ. by Editions de l'Aube, 2011]: real vitamins for the spirit in time of shortage of hope to a rosy future! 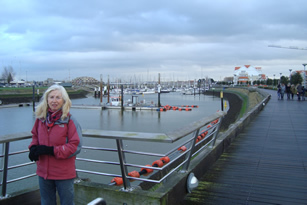 Except a solid cold snap in February, the weather here was ideal to enjoy our little piece of North Sea coast. 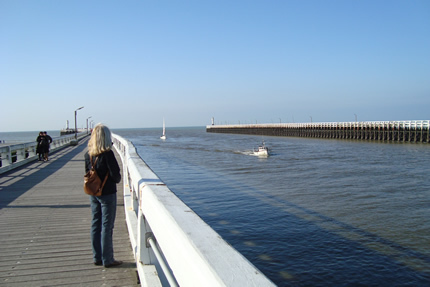 Nieuwpoort has now with the new (bicycle-)ferry the nice capstone to the well maintained and well marked out hiking and cycling trails. 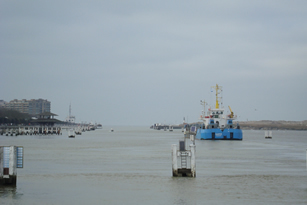 In the three marinas and in the channel of river Yzer it was winter business as usual: during our whole stay we were looking to round the clock dredging works. The winter is also the time of annual check-ups at doctors and dentists. 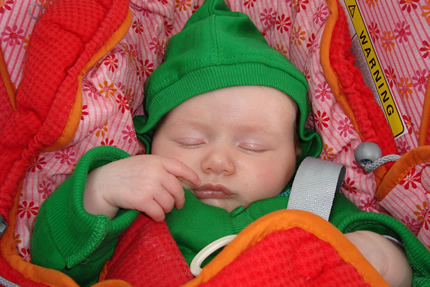 Lena, Helen and Olivier's daughter. 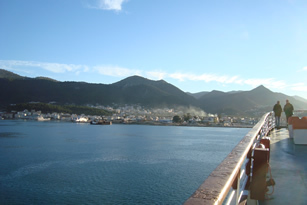 It is Greece which has just woken up from a cold winter - more rigorous and wet than the precedents - we find at the arrival of the ferry in Igoumenitsa, on this Monday afternoon, the 26th of March. 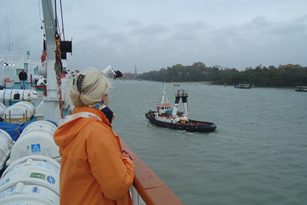 We left Nieuwpoort four days earlier and we joined the port of Venice yesterday, Sunday the 25th. A trip without problems by Lille, Reims, and Strasbourg, not without having , for a last time, kissed little Lena and her mom, while Olivier was teaching on this nice spring morning his students the technical subtleties of working on parallel bars. After about 700 KM we made an overnight stop at the Etap hôtel of Sélestat - for the convenience of the arrival and the departure. The next day, Friday the 23rd, in the early morning we enter in Switserland at Bâle. By the San-Gothardo tunnel and the Lugano lake, we pass the Italian border around 15H00. 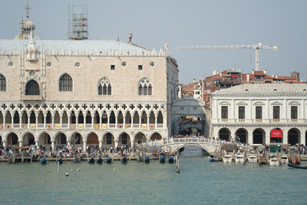 We have made a reservation for a two night room at Hotel Maritan, in Padova. Close to the Old town and not far from exit 16 of the tangenziale, this hotel has a private parking place, witch is a determinating element by our choice because our car is absolutely fully packed. 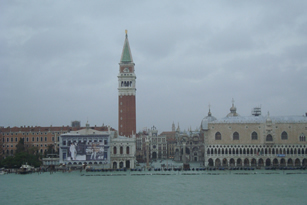 We have passed many times by Padova but we never made a stop - to close to Venice, not far enough from Verona ! - but now we will put right this error ... and Padova is wonderful ! Two days later, on Sunday the 25th we embark on the Kriti I of the Anek company, which last years had our preferences but which this time was rather disappointing. 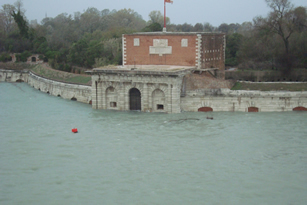 Departure was planned at 12:00 o'clock but the consequences of the 3-day strike of the previous days having still not been neutralized, it was 2:30 pm when the Kriti I started the descent of Canal della Giudecca. 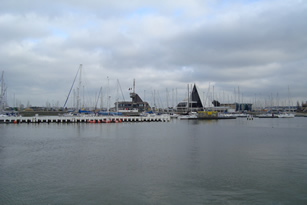 We first go to the marina to reassure us about the condition of our boat which we abandoned on the hard on October 14th - as always with a mix of sadness and anxiety. While before our departure we could park the car near Nehalinnia we find our dear small sailing boat well hidden behind the very numerous yachts which came to winter here. 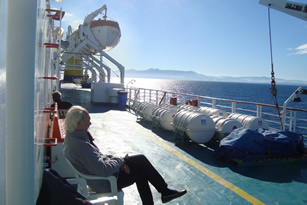 Reassured, we reach villa Athene ( website link, update 2013 ) in Apolpena, having warned Tony of our late arrival. 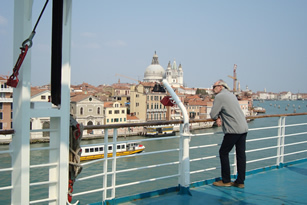 It is only on our table at Sto Molo, on the quay fortunately still deserted by noisy crews of charter boats and the other tourists - Frini having wished us with her big smile a kalo irtate -, that the stress of the voyage disappears for a mild and well doing fatigue. 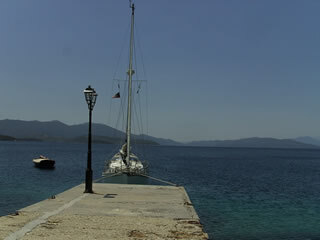 27.03.12 Lefkas. A lot of little occupations, the routine of a return. A passage at the Vodafone shop for reloading the prepaid card of our mobiles and updating the data for the payment of our Vodafone Mobile Internet account. Back to the boat where we meet Leslie Wood from Ionian Composites who is putting a last coat of gelcoat in the chain locker. 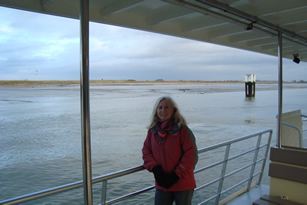 A passage at the marina office to reserve the launch of Nehalinnia. 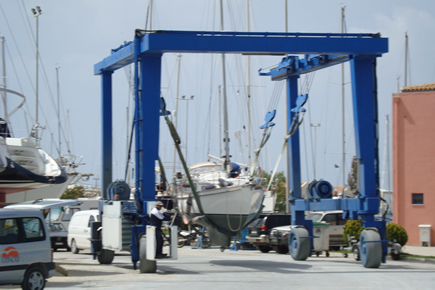 A call to Simon Trippier who runs Sivota Yacht Service: he will assist us for the launch on April 24th, due to the works which he's finishing. A check of the equipment and the small bicycle we left in the store-room of the marina. A call to Neil Mc Robert's for the bill of renewing of the deck/roof caulking. 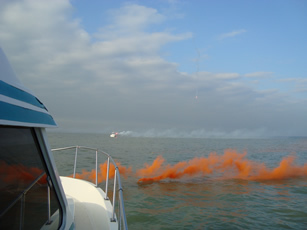 A passage at Nikos Stamatakis' Ionian Marine Safety shop to order a set of new distress flares. Return to Villa Athene to prepare the luggage and the equipment for the boat which we'll leave in the villa and what we have to take to ... Hortó. Because tomorrow we leave for ... Hortó!. 28-29.03.12 Hortó. We know the road which we have to follow to reach Hortó rather well as we have taken it many times. 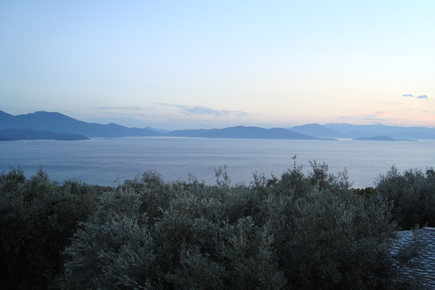 Nevertheless after the fork towards Nafpaktos and et Amfissa, just before the bridge of Rio-Antirio, we are amazed again at the variety of the landscapes which offer in this early spring an awakening of colours and shades unknown by the summer traveler. In Galaxidii where we make a lunch stop in the small Liberty tavern the light illuminates the snow on mont Parnassos. We take the E65 which leads us by the mountains from Amfissa to Lamia, and which remains burnt in our memories as the road of the breakdown. Then we reach the-so-called-but-always-in-unfinished-construction-highway going from Athens to Thessaloniki and which we leave little after 4 pm towards Volos. The passage of the city is quickly made because at the present time - and besides by the closure on Wednesday afternoon of most of the shops - there is little of traffic contrary to the usual, intense and often chaotic situation. We need another full hour - including a stop in the small supermarket in Argalasti - to arrive in Hortó. 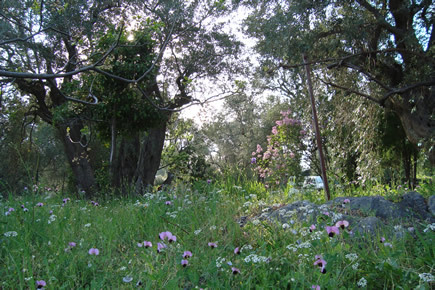 At 5:30 pm we enter into the garden of the house that we are going to prepare for the summer. It's for the charm of this small village which we discovered in 1992 on our way to the island of Lesbos and where we spent three wonderful long holidays, that we have imagined the project of the voyage which we started in 2007 and which we realized by mooring Nehalinnia, on stern anchor, at the small quay on June 9th, 2009. 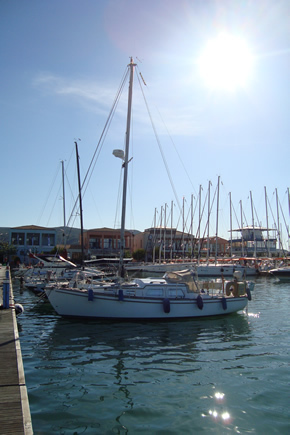 It is for the charm of Hortó that we want to redo this sailing trip at the end of this spring and that we hope to spend the summer here with Olivier, Helen and little Lena. 15.04.12 Hortó. We are now about two weeks in Hortó. We have organised the house a little more according our wishes, we have planted for more colour some flowers in the borders around the lower terrace and we have finished the cleaning of the path and the terraces. The first days we had to water the garden but now the nature is doing the job: the weather is rather capricious, alternating nice sunny days - mainly during the morning - and days with heavy showers bringing a real coldness. Today it's the Greek Eastern, and the sun is shining well while temperature is around 22 degrees C. We can realise, like the former years at Lefkas, how important this celebration is for the Greeks. But here, in this small village everything is more intimate, more family. Yesterday evening while we had our meal in the small Perigali taverna -grilled barbounia and lavraki, a mixed salad with olive oil, feta sprinkled with oregano, a small carafe fresh white wine and water - we felt - being as usual before the season the only clients -, the slight tension while midnight was approaching. 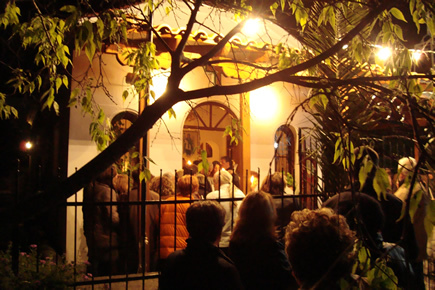 The whole family, the grandparents, the young couple with the two little girls coming from Volos, were preparing to go to the small church where already numerous villagers were gathering. While the service, which has started a few hours before was evoluting to the supreme moment, while the prayers of the celebrant were intensifying, there was already a small crowd of about 200 people. 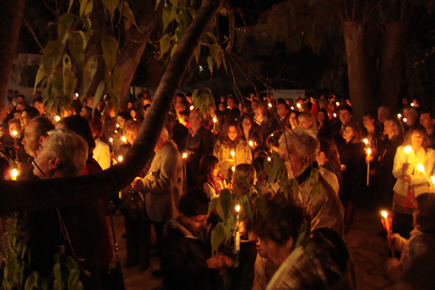 Then at midnight while the priest coming out of the church started the long ultimate Easter prayer and while the bells were ringing, by the flame that was bringing out of the church and that people were passing each other the candles that they had brought were lighted. People started to salute each other, congratulating, kissing, wishing chronia polla, and small firecrackers and flares were sounding and illumating the moonless night. 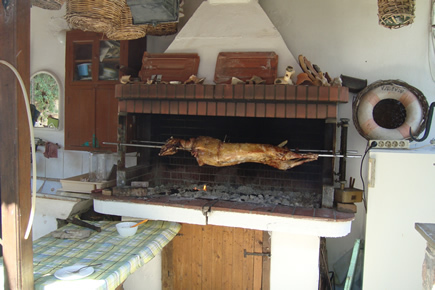 On midday this Sunday we are invited by Yiannis , to share with his family and friends the Eastern lamb that according the custom is spit-roasted. First we get a lot of home made mezze's - tzaziki, tarama, a special species of chorta, olives, cucumber and tomatoes, small lachanopita, feta -, also kokoretsi - a spit-roasted liver roulade -, a typical dish from the Greece mainland, thereafter the principal dish, the nice juicy lamb, is served with various salads. Yiannis let us taste his home made quite natural white wine, a small production without any additive. A little later the dessert - a choice of pastries - is served on the large table on the terrace under the vine - home made galaktobouriko ( a kind of flake filled with vanilla cream ), chocolate bavarois, and a Black forest ( well tempting glyko's but Eric has to resist due to his gluten intolerance! ). This simple and warm hospitality, and the friendly atmosphere on this Greek Eastern celebration will remain as a very nice experience in our already so numerous memories. 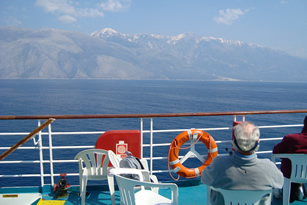 But the moment of going back to Lefkas and to our boat is approaching. 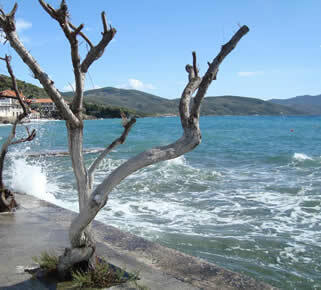 Lefkas 24.04.12 Since April 17th we are back at Lefkas.. The story. Tuesday, 17th. To check the hours of passage of Chalkis-bridge ( Halkida ) when we'll be sailing next month along the coast of Evia, we prefer to go to see on the spot rather than to inform by telephone. At the coastguard's office they confirm the closure on Saturday and Sunday ( besides the usual closures as mentioned in the pilots ) like that had been decided last year when the bonuses for work during the weekend were repealed. Besides statutory and administrative changes, we know that now in Greece it is also necessary to take into account demonstrations by unions and often unpredictable social protest actions. It is not very probable that the elections which will take place May 6th will bring more certainty. Between Volos and Lamia the works for the new motorway are apparently still stopped: nothing has changed since our first passage, since years, in March 2009, except that all the begun works seem to deteriorate a little more over the years! From Lamia to Chalkis ( but then we are not so far from Athens ) the motorway is widely finished and the (numerous) toll stations are operating! We pay 10,25 euros for the whole trip. Not having taken into account the returns towards the capital during this third Easter Day, we are in an intense traffic! 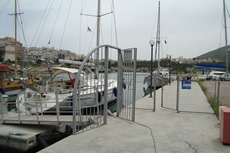 Now that we are in Chalkis we have a look at the small marina - south of the ancient bridge and close to the yacht club - which was in construction on our passages in 2009 but is finished now. 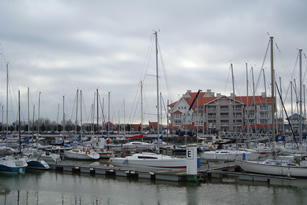 Three or four concessions manage a quartet pontoons where a surprising number of boats are moored ( water and electricity, lazy lines, but no showers! 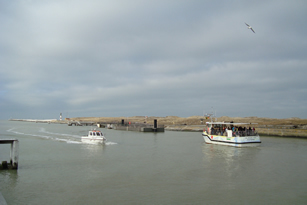 ), while the first pontoon and a part of the quay can be used during the wait for the bridge passage. It's 1 p.m. so we decide to make also a lunch-stop at the terrace of one of the numerous ouzeris and other restaurants on the continental bank. 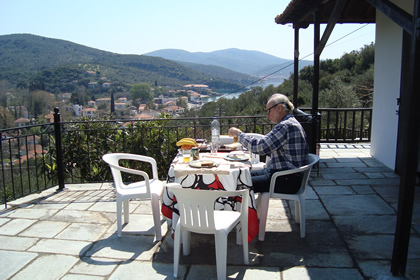 Ouzeri Enarxi seems nice, situated in front of the city and with a view on the bridge: we order grilled sardines, a tomato-cucumber-pepper-olive-onion salad, tsaziki, and a big bottle mineral water ( it's drinking or driving! ). 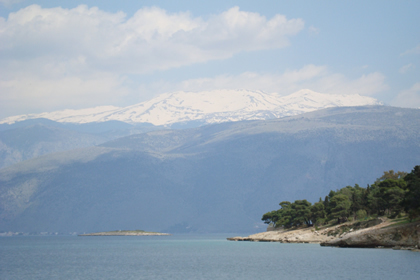 By the road of Theba and Livadia, after crossing the foothills of Mount Parnassos and keeping Delphi we have visited several times on our right, we join the gulf of Corinth in Itea. 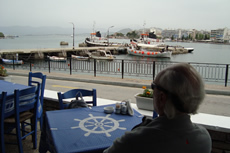 We make a coffee break in Galaxidi where numerous Greeks are still on ( Eastern ) holidays. 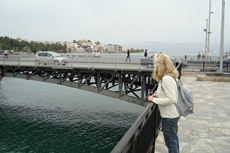 Then by the road which follows the north coast of the gulf we join Nafpaktos. It has started raining. On the road towards Messolonghi and after that, to reach the ( unique ) finished section of the motorway Patras-Ioanina, again traffic is intense but in the opposite direction this time. The often risky overtakings, the heavy rain and the bad visibility impose a careful but tiring driving. 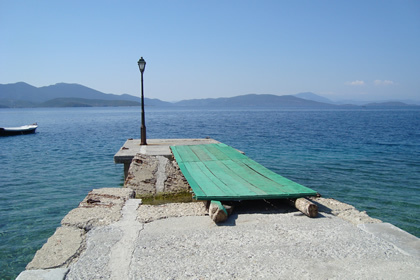 From Amfilochia to Lefkas by Vonitsa, the road is in a terrible state, and the improbable but gigantic earth-moving works for the new motorway that must connect Igoumenitsa, by Preveza, with the motorway Patras-Ioanina have only worsened the situation. 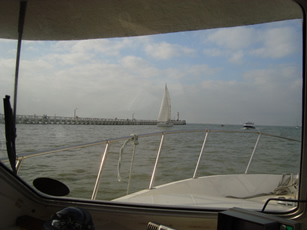 Passing by the marina, we have a short look to our boat. Simon Trippier couldn't yet assembly the propeller shaft because the flexible coupling has not still been delivered. Disappointed and a little worried for date of the launch we join our shelter in Apolpena in the early evening. Wednesday, 18th and Thursday, 19th. Two rainy days, the stormy disturbance wouldn't move. Cold weather. Friday, 20th. It's a nice day - temperatures above 20 degree C, but the south wind brings ,at times, also the exhalations of the huge tip!. 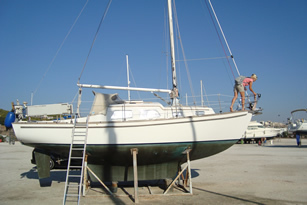 So we can not only wash the boat and treat the teak deck but also polish the hull. A tiring work but that we finish this time in one ( long ) day! Monday, 23th. At last the flexible coupling is delivered and Simon Trippier can assemble the propeller shaft. A real nightmare to get this part: first ordered in January in the U.K. like mostly, it should must been ordered from the Greek dealer, then no delivery before payment ( the confidence here seems to have totally disappeared by the crisis now, complicating the already very uncertain deliveries ), new delay, then the delivered part is not the right one, new order, new delay, finally when the part arrives at Lefkas the delivery service carrier refuses to give the part until the problem of the double transport costs has been clarified. Polishing of the hull, first mechanical , then the finishing touch by hand ! 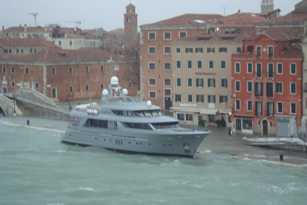 And then, today the 24th, Echlin is launched: the operation is this time unnecessary complicated by the carelessness - or the absence of planning - on behalf of the marina. 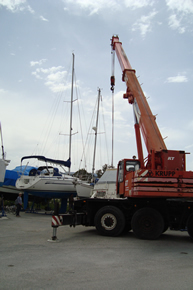 The whole action requires the preliminary move of two boats and the use of the crane before they can use - like last years - the travel lift. We just have to tell them that we have to put the rudder before going in the water ... because they just didn't see it! 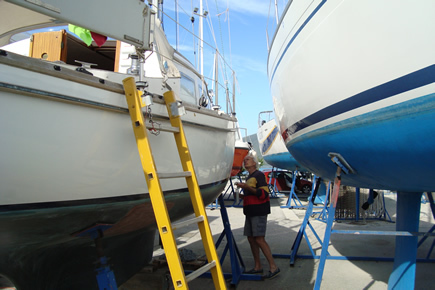 Before reaching our berth we first have to do a few manoeuvres so that Simon can check after all the works the correct alignment of the engine and the well operating. At 4 pm Kaat drives the boat to the pontoon, in an unusual quietness ... now after the modifications done by Simon, our small engine is - after 6 years! - , almost silent! And we, we can start our work: a big inside cleaning is needed, before we polish the roof and the cockpit, varnish the cockpit door and the sliding hatch. Lefkas Marina 09.06.12 According to our ( already revised ) planning we should have started our cruising towards Hortó mid-May: alas, this was without taking into account a sudden succession of electric problems. That our planning was optimistic, it is - after! 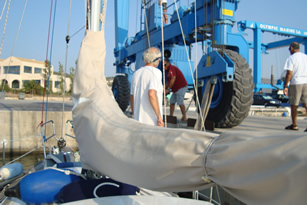 - obvious, because in case of technical problems on a boat in Greece, now, then there is a lot to bet that there will be lost a lot of time, even with the best, the most devoted, the most motivated technician - and it was our case judging Simon Trippier's perseverance ( Sivota Yacht Service ) to solve the problem! But if a part needs ten days to come from Athens, if an other part is not the right one which was ordered, or when a manual does not bring any clearness looking about the connection of the device - or the connection between more devices - for a possible explanation for occasional power cut, then there are only two possibilities: either the reinstallation of the whole electric circuit, from the batteries to the switch panel, including the replacement ( after direct delivery from abroad ) of the alternator, the digital regulator, the digital insulator of the batteries, the shunt, the charger, the main switches and all the cables and wiring, or like a sharp sleuth going in search of one or more culprits! The first method is doubtless faster but a lot more expensive, the second requires patience and a lot of luck. From our arrival in Greece on March 26th we had already had to give up the hope to start our sailing towards the Pagasitikos Kolpos at the end of the first week of May - like we did in 2009. Mid-May seemed then realistic. But also this date quickly seemed too optimistic and as one goes along we were forced to postpone the date of departure. 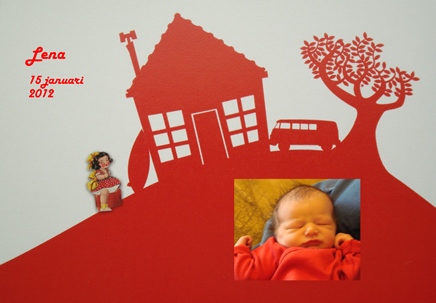 Today we realize that the scenario of an arrival at Hortó mid-July or even later seems to become reality. Since 1995, on our modest sailboat we always privileged the safety and we always composed with the weather by taking careful margins and this is what we want to continue to do. If the forecasts announce 6 to 7 bft for Korinthiakos and for Saronikos and N.Evoikos 8 bft, it would be absurd to leave Lefkas to be blocked in Messolonghi! 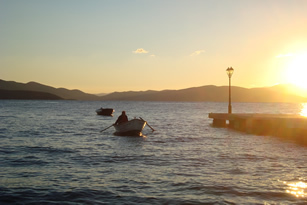 If we don't want to risk to spoil partially our holiday plans with Olivier, Helen and little Lena then it is necessary to imagine now a good alternative to bring the boat to Hortó - 400 NM from Lefkada - without giving in to the pressure of urgency. With a skippers-couple he wants to bring the boat without stop to Corinth after which the skippers would sail the boat to Hortó. 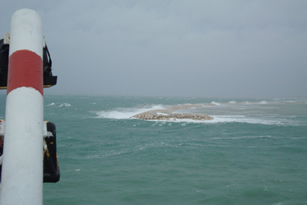 The skipper has a lot of experience and has all certificates which establish formally his expertise, what is indispensable for the insurance of the boat. 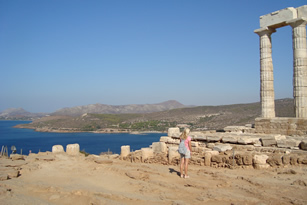 Everything pass off as expected up to cape Sounion. But when a strong meltemi starts blowing the RYA-offshore skipper has to give up. The forecasts gives no hope: for the next ten days strong northerly winds 6 - 7 with gusts of more than 40 knots are expected in this narrow sea between the continent and the island of Evia. 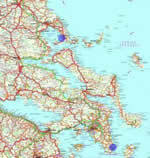 Because it seems that the meltemi is now established with more strength and constancy this year, we take in agreement with the skipper a painful but rational decision: Nehalinnia is temporarily hauled out and will stay safe on the hard at Olympic Marine, the perfectly equipped marina 7 miles north of cape Sounion and five kilometres south of Clarion. So we do a choose for the safety of our boat and for the well keeping of the holiday project with Olivier, Helen and Lenaki. ... after a rational but not easy decision! 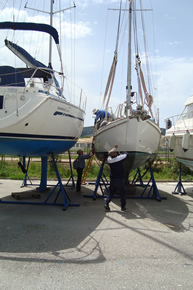 9 a.m. : while the strong N-ly wind is already blowing we desalinate our boat, cleaning the hull and the propeller. Discover by following this link nice summer pictures! 30.08.12 It is near 10.30 pm when we are back in Hortó: we have been driving more than 900 km by car: a round trip to Olympic Marine-marina, a few miles in the North of Cape Sounion and about 50 km in the southeast of Athens to have a look to our boat. On the severely guarded hard - we had to decline our identity twice! - Nehalinnia was waiting for us faithfully. Covered by fine dust our sailing boat had resisted the violent summer winds, but after a full rinsing Nehalinnia was shining again like when we had left at the end of June. We brought some equipment and little provisions because we want to finish the interrupted transfer towards the Pagasitikos gulf and Hortó when the strong Northerly wind will decreases - but the 7 days - forecast is still giving 5-7 bft between the island of Evia and the continent, particularly for the southerly gulf of Evia, Ν[OTIOS] ΕΥΒΟΪΚΟΣ. Hortó 11.10.12 Finally we decided to leave the boat, this winter, at Olympic Marine: during practically the whole month September the wind was blowing force 5 - 6 from the North (mainly) in the Evoikos kolpos and the two or three days of little wind were a too short time and were to little predictable to start the sailing northwards along the coast of the island Evia where ( small ) safe harbours are extremely rare. 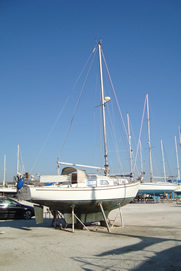 Besides, we had hauled out the boat and cleaned the hull: so, launching only to reach the yard in Pefkakia near Volos to haul out again seemed us, being mid-autumn, rather absurd. 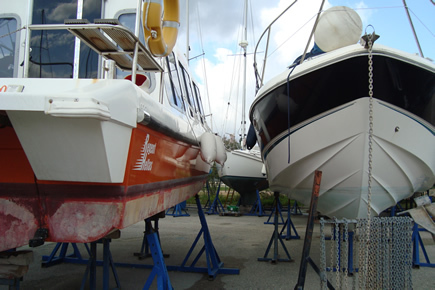 The rate for the hard stand wintering at Olympic Marine is reasonable( unlike the excessive rate afloat! ) 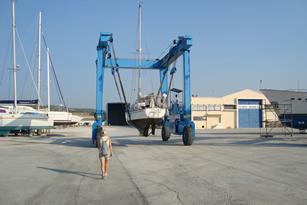 and the owner of the Pefkakia boatyard immediately suggested that the deposit for 2012 should be transferred to 2013. So, we thus returned to Lavrio to prepare the wintering of Nehalinnia and from this short stay ( we found a small hotel at 2 km from the marina on the road to Sounio ) we took advantage to visit again cape Sounio and the temple of Poseidon, indeed, for the fourth time but the last time was more than twenty years ago! We still think that the view from the cape is more beautiful than the nevertheless very impressive sight of the temple from the sea, as we already had noticed in 2009! On the road back, just before Lamia, we make a detour along the Thermopyles where the Spartans were massacred by the Persians in 480 BC. On the side of the mountain, hot sulphur water bubbles out of the rock: the pass derive its name from these thermal springs. It's still nice weather - around 27 to 30 degrees last week. Since mid-June we got exactly 2 rainy days. Then, yesterday finally a big so expected shower came to quench the thirsty nature. Hortó now has found this mild after-season quietness, this peace which makes that any movement, any change, any presence are immediately detected. And when every afternoon we are going down to the beach for a swim, by the kalderimi , and crossing the village, rare are the villagers whom we meet and who greet us - our simple presence now makes us acceptable as part of the village! 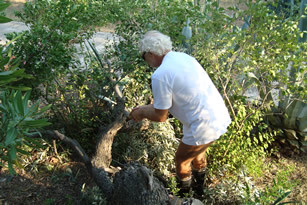 Nevertheless we feel that the inhabitants get ready for big works: in five or six weeks the harvest of the olives will deliver the this year exceptionally heavy-loaden trees. Every morning Kaat makes a nice walk with Eirini, who holds with her partner Stathis the excellent Evochia restaurant, where we went almost every evening; in the meantime we became friends. Last Sunday was the last day of seasonal opening of their restaurant: they offered us the dinner; on Eric's birthday they even have served by way of present a supper in four dishes with personalized wines! 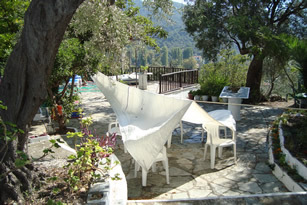 Although we are busy occupied all day long, now by the cleaning, rinsing and storing of the boat equipment - the rinsing of the sails, the hood and the spray hood -, by some maintenance or painting work in the garden or the house, there is also time for reading a book and for dolce farniente on one of the terraces. 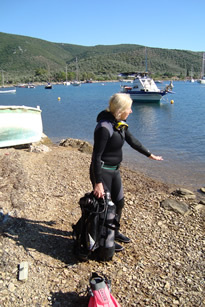 Kaat followed, during a week, a training course at the Pelion dive centre - a beautiful small coral reef has luckily been protected - and she obtained 1st level Open water diver certificate, a.o.t. after undergoing an examination for which she had to study very hard during three long days! 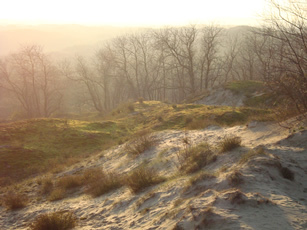 By following this link you will discover a few nice pictures taken this autumn. 12.11.12 After a four days long trip we arrive on Monday in the late afternoon in Belgium. 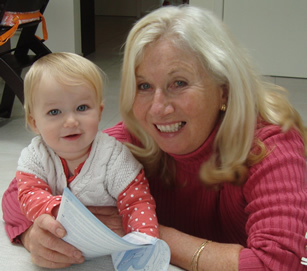 Before reaching our apartment in Nieuwpoort we pass at Olivier's and Helen being very keen to see little Lena again! The three months ago seven-month-old baby who was - very hesitant - trying to move ahead, is now a little girl who, following you on all fours, cross the room, pulls up on everything, searches for balance to make soon her first autonomous steps, tries - well determinated - in a still very incomprehensible gibberish to communicate with you or, switches from a arch smile or from a cooing laughter to a worried glance, grasps the spoon with fruit mix, and brings her double-handled goblet to her mouth! 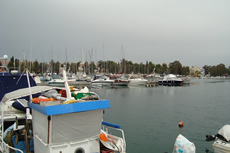 The current weather in Lavrio and Olympic Marina? Click here! The current weather in Hortó? Click here.